The Glen Ellyn Park District has been selected by organizers as the grand marshal for this year’s 4th of July Parade in honor of our 100-year anniversary. The parade steps off on Thursday, July 4, 2019, at 12 p.m. in downtown Glen Ellyn. 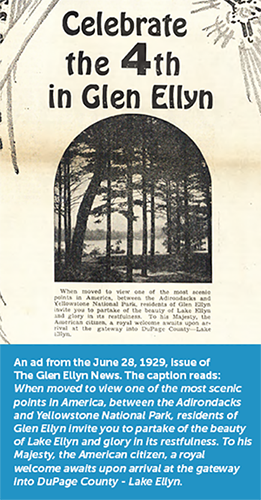 The Glen Ellyn Park District has a long history of helping plan, organize and implement activities to make Glen Ellyn’s July 4th celebrations one of the most memorable in Chicagoland. Records can be found as early as 1929 inviting the public to Lake Ellyn Park to celebrate the holiday. In addition to having a float in the parade each year, the Park District offers a full day of activities including the Freedom Four™ 4-Mile Run in the morning and Afternoon Festivities from 1pm-4pm following the parade. The District also provides Lake Ellyn Park as the primary spectator area for the Glen Ellyn 4th of July Committee’s fireworks show and hosts the annual Lake Ellyn Cardboard Regatta on the Saturday proceeding Independence Day. “The Park District will be inviting current and past elected Park District Commissioners to help lead the parade, as well as, continuing the tradition of have several youth athletic programs march,” Harris said. For parade details, visit the Glen Ellyn 4th of July Committee’s website at www.glenellyn4thofjuly.org. For more information on the Glen Ellyn Park District, visit www.gepark.org.